For the The Hawaiian Mint (THM)/Royal Hawaiian Mint (RHM) collectors: I recommended that you understanding the cross referencing technique between the Medcalf & Russell book and the Royal Hawaiian Mint database. It will aid you making a decision in making the purchase of a THM or RHM issue. As an example, there is a 2MB-147 (in 18K gold) listed today at a relatively large auction site. Lets investigate this specimen identified as 2MB-147. 1) Look on page 135 of M&R. yes, 2MB-147 is listed there. 3) In the RHM database, find the die pair (obverse King Kalakaua and reverse 1981 Aloha Pineapple) matches. Conclusion: No 18K is listed for the die pair (Medcalf & Russell is in error). BVN did take the time to cross reference his issues with the M&R book. 2MB-147 simply does not exist (in 18K gold). There is a single 24 K gold listed in the RHM database (maybe…maybe not..). I would do a one-on-one inspection of the coin to determine is its gold plated or 24K gold. I have a suspicion that the 2MB-147 listed is a gold plated bronze. Someone simply used M&R book to add the identifier 2M-147 on the holder. I recommend you ignore the label and inspect the coin carefully. If you go back to the RHM database and look at the other obverse designs with the Aloha 1981 Pineapple reverse. The Kamehameha I match is labeled gold plated. As well as the Madame Pele match. The Captain Cook is not labeled gold plated as well as the Kalakaua obverse. It can be said that the RHM database is in error for not listing these two (Captain Cook and Kalakaua) as gold plated. I did update my personal copy of the RHM database with this error. As for the auction listing, no thank you…I’ll pass on it…. By the way here is a bronze1981 pineapple that is not gold plated https://thehawaiiananumismatist.com/2013/11/02/1981-uniface-pineapple-design/ Would this coin sell as a bronze? Maybe as a gold plated bronze…. 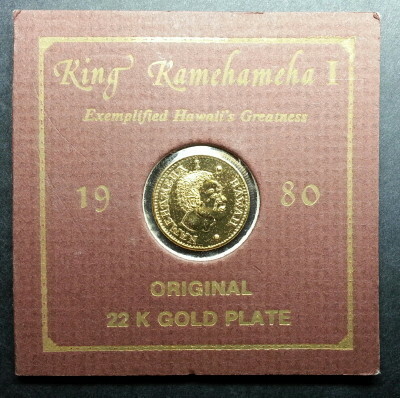 2MB-44 is 21 mm coin with the King Kamehameha I obverse and 1981 Pineapple design reverse. 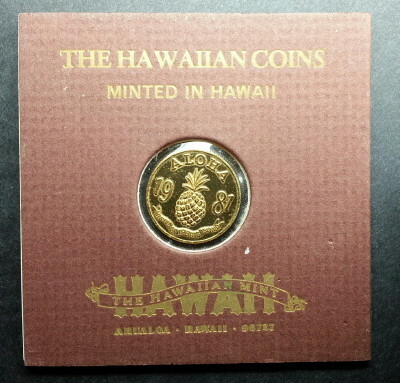 The “Pineapple” design has the words “ALOHA / 19 / (center figure of a pineapple) / 81 / MINTED ON THE BIG ISLAND”. Medcalf & Russell (M&R) indicates it’s bronze with a mintage of 650. 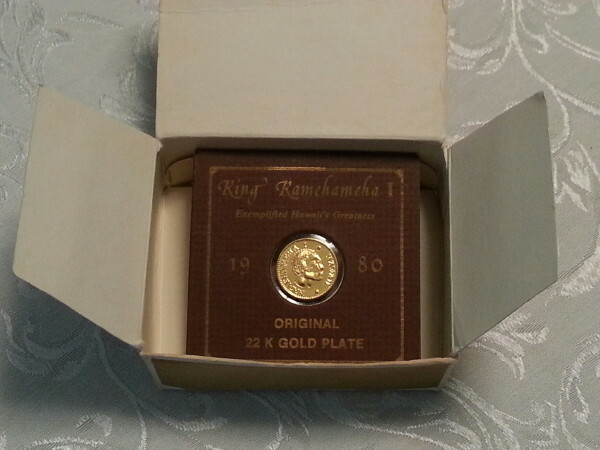 The Royal Hawaiian Mint (RHM) database indicates it’s bronze that has been gold plated and with a mintage of 1250. Note: M&R describes the coins as “MINTED ON HAWAII”. In reality, it’s “MINTED ON THE BIG ISLAND”. Note: The gold plated coins can be easily spotted with the proper knowledge. I’m not sure why The Hawaiian Mint issued a 24KT version and a gold plated version of the same coin design. It actually helps dishonest individuals immediately, by removing the gold plated coin from its packaging and selling it as an actual gold coin without its packaging. As a warning, I urge you to know the difference between a real gold coin and a gold plated coin. I have to believe by the RHM mintage figure of 1250. In addition, M&R never mentioned that 2MB-44 is gold plated bronze. One of the basic collector rule is to keep all original packaging of the item being collected. It will aid in authentication and help boost its resale value. 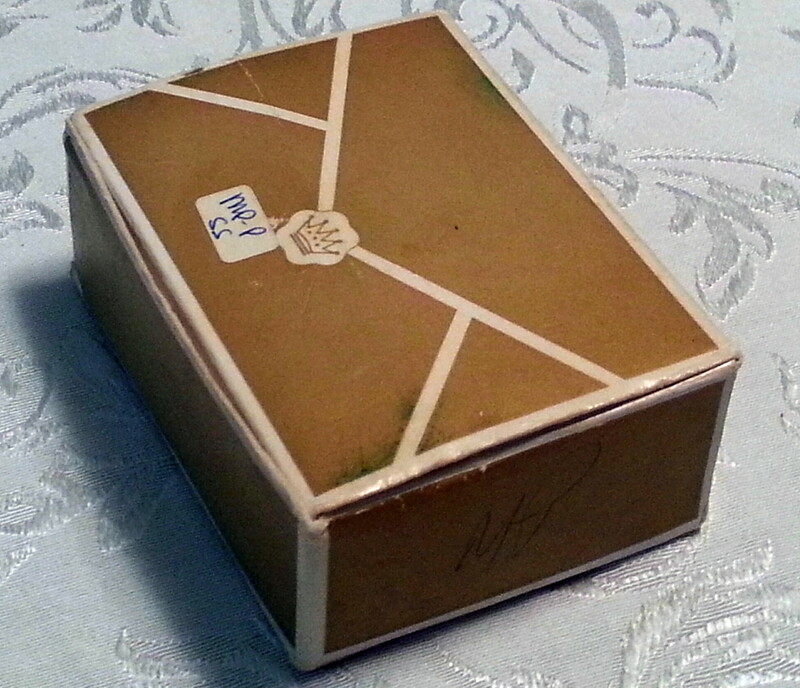 Below is a 2MB-44 in its original coin holder and issued box. 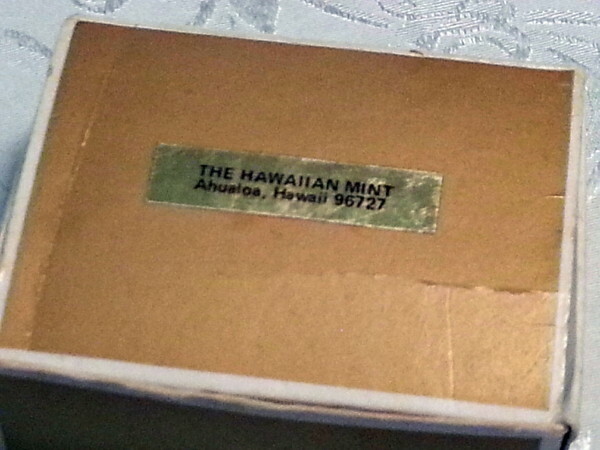 The inventory sticker (MP-P SS) on the top of the box is a normal inventory practice that The Hawaiian Mint used and can be seen on their product packaging. On the bottom of the box is the company’s gold sticker (another practice used to label their products). Both stickers legitimize the box as an originally issued by The Hawaiian Mint. As for the coin holder, its all original and sealed. I’ve noticed and documented (in my personal notes) that the shape of the 1990 Honolulu Dala (cataloged as 2M-184 in Medcalf & Russell) has been altered with the first day of issue counterstamp. The anomaly is that the shape of the coin is not longer perfectly round. I experienced the shape anomaly first hand after trying to fit a specimen I purchased in to a protective 39 mm capsule. It would simply not fit. What I noticed was that the first day counterstamp was struck very close to the edge making the rim expand outward causing the altered shape. Below are two examples. Look at the rim area near the counterstamp for the shape anomaly. Page 308 of the book Unusual Wold Coins 6th Edition, by Cuhaj & Michael, issued by Krause Publications list the coin as X#MB52 and provides an image that also reflect a more pronounced shape anomaly. The shape anomaly is attributed to the size of the counterstamp. The counterstamp on this coin is 13 mm, where as the other RHM counterstamp coins use a 10 mm counterstamp. Two rare sleeper bronze medals were on eBay this evening. I called them sleepers because they are relatively unknown to the the Hawaiiana specialist. One sold with no opposing bids. The other ended with an auction war. The first sleeper was a 1990 Honolulu Dala pattern in bronze with gold plating. Mintage is a scant 45 specimens. The hammer price was a mere 92 cents. Yes, 8 cents shy of $1. Listed in the RHM database and unlisted in M&R. The second sleeper looks like a 1883-1983 King Kalakaua Centennial bronze pattern with a mintage of 90. I suspect a bidding war from two perspectives occurred. There was a pattern bidder (believed the coin was a bronze pattern). There was a mule bidder (believed the coin was a bronze mule). 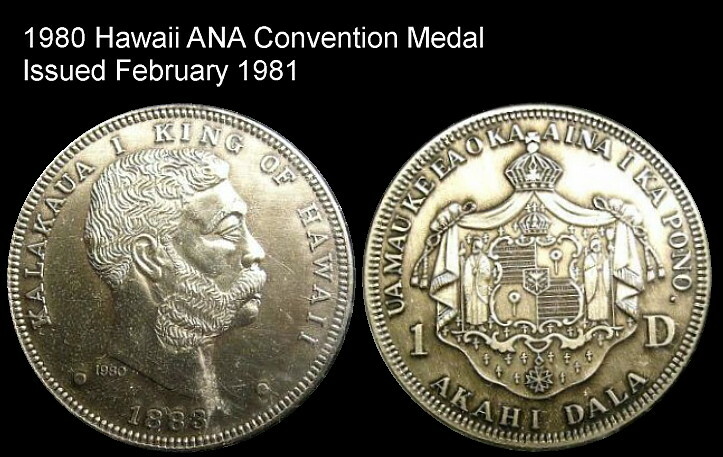 The coin is really a rare bronze mule with the 1883-1983 King Kalakaua Centennial obverse mated with a “THE HAWAIIAN MINT 1975 /HONOLULU, HAWAII” reverse. This is the first time I have seen the die paring and the first time I seen the reverse die used. The reverse design is not documented in the RHM database nor M&R. The final hammer price was $160.49. This specimen is interesting as it was part of a 100th Anniversary Centennial Collector Set with original COA and wooden box. The King Kalakaua Centennial mule’s image is below and I believe this blog entry is the first to identify its existence. I can render a guess that only a handful of King Kalakaua Centennial mules were made (as test strikes) and the specimen that was sold was mixed up with inventory of the 1883-1983 King Kalakaua Centennial bronze patterns. This is most likely how it was placed in the set. As a child growing up on Oahu, I visited the Waikiki Aquarium on grade school field trips and with my family. It was a very exciting place to visit growing up in Hawaii. I’m still investigating issues by The Honolulu Mint. Below is a result as part of my research. From my contact with the Waikiki Aquarium, they sold out their inventory back in 2004. 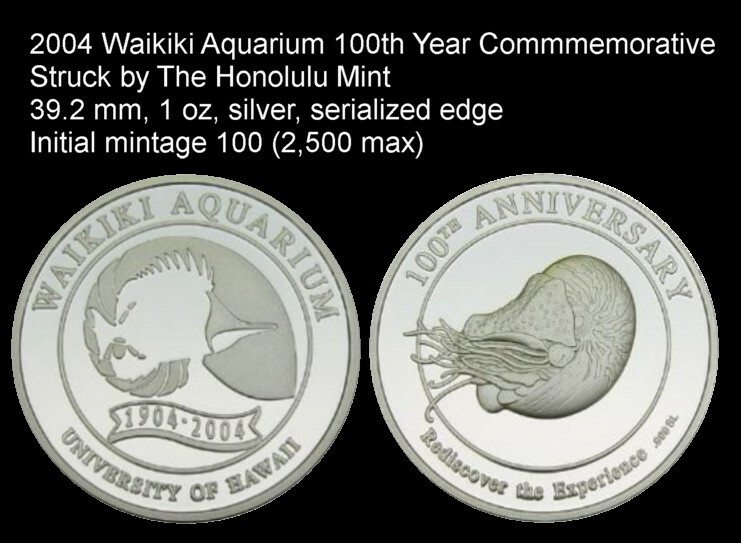 The image below is of the elusive 2004 Waikiki Aquarium 100th Year Commemorative that was struck by The Honolulu Mint. The reverse has “SL” minters initial. SL= Stan Lee. 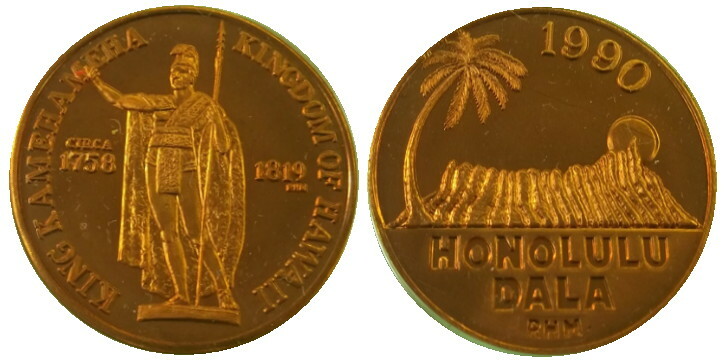 The Kingdom of Hawaii Kalakaua Akahi Dala is an iconic coin design that is replicated by various mints. One specimen of particular interest and can be easily identified is the 1980 Hawaii ANA Convention Medal. If you look closely on the obverse, next to the left dot is the year 1980. This medal is unlisted in Medcalf & Russell and a THN number will be assigned. If you understand the NGC requirements to get a specimen properly numerically graded (PR 1 – MS70) you will understand why the HK-722, HK-722A, and HK-722B so called dollars have an extremely low NGC population. The HK-722 series has a dilemma.